CRDOWNLOAD File Extension - What is a .crdownload File and How to Open it? CRDOWNLOAD File Extension – What is a .crdownload File and How to Open it? If you happen to use Google Chrome there is a high probability that you have encountered files with the extension “.crdownload” in your Downloads history. 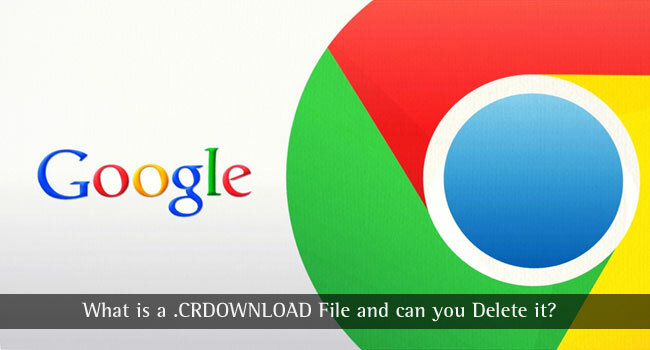 A CRDOWNLOAD file is a partly downloaded file created by Google Chrome browser. It stores the contents of a file as it receives from the browser and uses the “.crdownload” extension. This suggests that the file is not completely downloaded. It could be a paused, a failed, an incomplete or an interrupted download. After the download is complete the “crdownload” extension is removed. However, if there is an error in downloading, then the CRDOWNLOAD extension will remain intact signifying that a file has not finished downloading yet. For example, if you are downloading an MP3 file, it may look something like soundfilename.mp3.crdownload. Why Does Chrome Create CRDOWNLOAD Files? Google Chrome creates .crdownload files for all the files that you download. For instance, suppose you start downloading an audio file named Audio.mp3 in Google Chrome. “Audio.mp3” will pop up in your list of downloads in Chrome, and a file named “Audio.mp3.crdownload” will appear in your Downloads folder. The size of the file will keep increasing as Chrome continues to download the file. If the file is successfully downloaded, Chrome will remove the file extension and rename it to Audio.mp3. If the file still has .crdownload file extension then it hasn’t finished downloading yet. Some web browsers may temporarily store ongoing downloads in a separate folder and move them to your downloads folder when the download is finished, but Chrome stores the incomplete files in your Downloads folder. If you see a .crdownload file, check your list of Downloads in Chrome. You can view the Downloads bar at the bottom of your Chrome window or click the menu and select Downloads. If the file is still downloading, don’t delete the .crdownload file and let Chrome finish downloading it. If for some reason you do not want to download the file anymore, you can cancel the download in Chrome. Chrome will automatically delete the corresponding .crdownload file when you cancel a download. When Can a CRDOWNLOAD File Be Deleted? It is possible to delete a CRDOWNLOAD file any time you want to. If there are not any in-progress downloads and you do not require the file to resume any download, go ahead and delete it. You can also delete the .crdownload file when you no longer need it. For example, if you check your Downloads folder and see files named Audio(1).mp3 and Audio.mp3.crdownload, you can delete the one with .crdownload extension. That is simply an incomplete download file which is not required. If you see an old .crdownload file associated with a file you tried downloading long ago, you can certainly delete it. This may occur if you do not clean your downloads folder regularly. How to Delete the CRDOWNLOAD Files? Google Chrome creates a CRDOWNLOAD file as soon as you begin downloading a file. If you do not want to continue with the download anymore, you can cancel the download in Chrome. 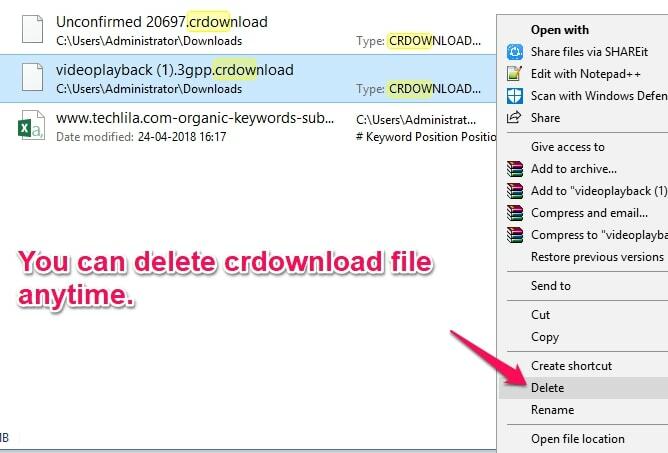 Google Chrome will automatically delete the linked .crdownload file when you cancel the downloading of a file. You can also remove a CRDOWNLOAD file from the Downloads folder. But when you try to delete a .crdownload file from Downloads folder an error message, “The action can’t be completed because the file is open in Google Chrome“, pops up on your screen. To remove this error, close the file in Google Chrome. The .crdownload file is a reminder that you wanted to download a particular file, but it did not download successfully. It is a good practice to clean your Downloads folder regularly to avoid ending up with a stack of redundant .crdownload files. 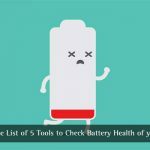 If you find that every file you download has the .crdownload file extension and none of them seem to be downloaded completely, it might mean that there is an issue or a bug with your specific version of Chrome. To prevent this situation you should either make sure that the browser is completely updated with the newest version from Google’s website or you may consider reinstalling Chrome altogether. Hi. An excellent informative piece of writing I have often wondered about the subject matter. It’s great that I can understand what to do about it. It’s very frustrating when trying to delete this kind of file however your information makes it easy.